Like the quote above, I believe we have control over our destiny. Although the words "fate" and "destiny" mean similar things, to me they are quite different. Fate is what puts opportunities in front of us but our destiny is ultimately determined by our decisions. For instance, if you go to a party and meet the perfect guy that was fate. But what you do about it is your destiny. I believe we are in full control of our choices and that our actions, in response to what fate offers us, matter. We are here to learn lessons and the hard decisions we have to make are what helps us grow as humans. Our destiny is not something we can sit by and let happen to us. We need to take action on the opportunities we are presented with fate may open doors but if it's our destiny, then WE have to walk through them. We can either let fate lead us through life or we can shape our own destiny. Bestselling author and spiritual teacher Deepak Chopra says we need a new way of looking at fate and free will. He believes that they are both influential in our lives, and that while fate might appear to have more influence over us, the balance keeps shifting the more we learn about it, so we might as well "assume that [our] potential for mastery is much greater than anyone now supposes." This is similar to how I believe our destiny can be shaped by our decisions. However, I recognize that this is not always as easy as it seems. 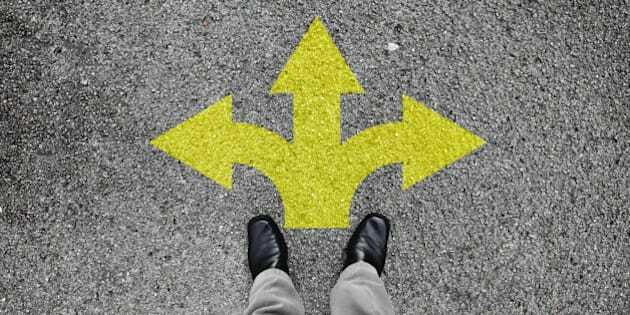 We often become frozen in our decision-making, feeling like the choice is out of our hands or part of some bigger plan that we aren't the director of. Have you ever wondered what it would be like to live in a new city, or even a new country? But when you think about actually moving, you make all kinds of excuses why you "can't" -- you're meant to stay in your hometown, other people move to new places not you, it's just not your destiny to live in New York/London/Paris -- whatever your dream city may be. But sometimes you need to be brave enough to go. Yes it can be scary, and yes it takes time to adjust, but a year into the move you will likely feel as at home there as you do here. So why not shift your destiny in that new direction if that's what you want? "Time decides who you meet in life, your heart decides who you want in your life, and your behaviour determines who stays in your life"
What about love? Many people have walked away from someone that might have been "the one" for various reasons. Maybe you met the girl or guy of your dreams but weren't able to commit and lost out. That's destiny slipping through your fingers. Fate can only do so much...it's up to you to act on it. Other people might be stuck in a bad relationship where they're unhappy but feel it's "meant to be" that they stay together. I read this great quote that said "many people are in relationships that are over, but haven't ended." Staying stuck is a choice; we can always choose a different destiny. If you don't have the love you want in your life, you need to take action to find it. Put yourself out there, be open to new possibilities and actively seek your own destiny! It can be hard to think of our destiny as being separate from our fate if we become accustomed to letting it lead our path. A lot of people look at life with a "que sera sera" (what will be, will be) attitude but if you think about it as something you have control over, you can make deliberate actions to create your desired destiny. This means being true to yourself and not being passive or only following other people's opinions. I truly believe remaining authentic is the best way to determine not just any destiny but the one that's meant for YOU. Fate presents us with the opportunities to create it, all we have to do is decide what destiny we want. When you think about it, isn't it better to believe we can control our destiny by making deliberate, conscious decisions than just being passive bystanders in our own lives? This goes back to creating a life for yourself that is in line with your authenticity. With the same attention we use to build our personal brand, we can shape our destiny. Ask yourself where you want your life to be in five years and work backwards. Understand what you value and what makes you tick. Decide what and who you want to keep in your life, and what has run its course. Don't sit back and let someone or something else guide you along; take the wheel and drive towards your own destination...your own destiny! Have you ever experienced fate putting an opportunity in front of you, but you didn't seize it and it passed you by? That was destiny. Or perhaps you DID seize it and created your own happy ending? Share your comments below or tweet me @NatashaNKPR. I would love to hear your stories!